After an 18-16-4 season a year ago, the expectations in Orono are raised a bit in the 6th season of the Red Gendron era. It was Maine's first winning season after three consecutive losing seasons. The Black Bears have the talent in place to compete as they just need to show it on the ice. A year ago Maine came into Hamden and came away with an impressive sweep of Quinnipiac that closed out the first semester for the Bobcats with a losing record. 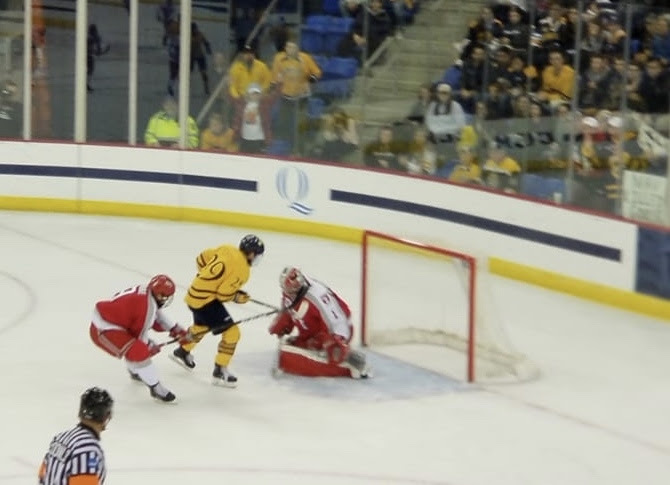 Quinnipiac is a different team than a year ago with more scoring and more confidence than they did when these teams last met. The Black Bears return nine out of their top ten scorers from a season ago with only Nolan Vesey graduating from last years roster. Despite that they are struggling a bit to score goals this season averaging just 2.4 goals per game. Chase Pearson leads the team with 7 goals and 11 points while Tim Doherty has 5 goals. Freshman Jacob Schmidt-Svejstrup is off to a good start with 6 points after having a strong season for Fargo in the USHL last season with 26 goals and 43 points. Mitchell Fossier has been great at dishing the puck so far with a team leading 7 assists. The Black Bears offensive struggles expand to special teams where the power play is converting at a tune of 14.6%. Defensively Maine has been solid to average at times giving up 2.8 goals per game. The penalty kill has been strong at 85%. Three seniors lead the way in Rob Michel, Keith Muehlbauer and Sam Becker. Sophomore Brady Keeper is also one to watch as he was strong offensively and defensively last season with 22 points and a plus 17. Overall the team is a minus two for the season so there is still some work to get done to make that unit more effective. Its an area that Quinnipiac needs to exploit. Boston Bruins draft pick Jeremy Swayman is the Maine goaltender back as a sophomore after having an impressive freshman season with a 2.72 goals against average and a .921 save percentage. The numbers this season for Swayman are similar with a 2.79 goals against average and a .920 save percentage. Outside of two poor games against Minnesota Duluth when he gave up seven goals and another game against UConn when he allowed five, he has been very steady for Maine this season. Last season against Quinnipiac he was huge in goal for Maine making 95 saves in a weekend sweep of the Bobcats in Hamden last December. A week after Quinnipiac had an impressive road sweep over Cornell and Colgate, the Bobcats can't sit on their 9-2 record. This series won't be easy at all but they need to go to Orono and return the favor to what Maine did to them a season ago to help build the pairwise resume along with momentum for two huge series the two following weekends.